Are you interested in providing service to your customers and revenues for your favorite charity? CALL US AT 636-282-0000 OR USE THE CONTACT US FORM FOR MORE INFORMATION. DISPLAY INFORMATION ABOUT YOUR BUSINESS. 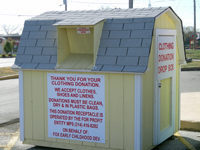 We are still accepting new charities to participate in our Clothing Drop Box Program. We provide and place the boxes throughout the community. Our friendly drivers collect the items on a regular basis and we send your non profit organization funds based on the volume of items collected. All maintenance, insurance etc is covered by us. THERE IS NEVER A COST TO THE NON PROFIT ORGANIZATION OR THE HOSTING RETAIL FACILITY!! MPS provides and maintains collection boxes, collects all items, and fully insures the boxes. There is never a cost or obligation to you or the non profit organization you choose to support. To participate provide us with your name, address, contact information, and which 501c3 non profit organization you want to support. We will do the rest. If you wish we will provide a quarterly statement of how much money your box generated for your non profit organization click here to log in. Hosting a box isa great way to support a charity of your choice at no cost or obligation to you. It also provides an additional service to your customers and is a visible sign that you are a steward of the environment and community. Combined local drop box hosts have participated in providing over $400,000 to local St Louis metro area charities last year. BP IS A PROUD SPONSOR OF THE AMERICAN RED CROSS. SAV-A-LOT HAS PROVIDED FUNDING FOR NON PROFITS FOR OVER 10 YEARS THROUGH THE DROP BOX PROGRAM. DIERBERGS HAS BEEN A SPONSOR OF MANY LOCAL NON PROFITS THROUGH THE PROGRAM FOR OVER 10 YEARS. Aldi's is a proud sponsor of Sunset Hills Kiwanas. Amdocs supports Voices for Children. Conoco supports Children's Home Society of St Louis. Dollar General has provided support for various charities for over 8 years. Schnuck's supports various local organizations. We thank PIZZA HUT for their support of the American Red Cross.